The thieves spotted what appeared to be a really sweet deal. In front of their eyes was an unguarded 2007 Volkswagen cargo vehicle with a movable platform and crane. Along with that, the vehicle seemed to be easy pickings: the driver was asleep and the vehicle was unguarded. Quickly, they overpowered the driver, tied him up, dropped him in a vacant parking lot, and drove away. They drove for about 24 miles and then decided to investigate the vehicle's cargo. What can it hurt? They thought to themselves. We've made a score, and we need to see what we've got here. In short order they unloaded the containers, broke them open, scattered the contents, and found nothing of interest. They may have found nothing of interest, but that doesn't mean they found nothing. What the crooks had opened up were containers of radioactive cobalt-60 pellets. Those pellets had been taken from hospitals in Tijuana and were headed for a nuclear holding plant located outside of Mexico City. There's one other thing those crooks found in those pellets. Those cobalt-60 pellets were small things, but they were deadly. 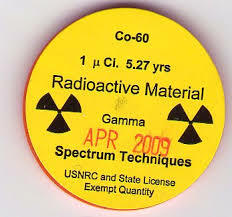 They carried enough radioactive punch to kill anyone who came into close contact with them. Death would come in two or three days. Although the crooks didn't know it, when they looked into those containers they became walking dead men. Their story isn't so much different than that of Adam and Eve who thought the forbidden fruit wasn't such a bad thing ... or King David who believed a little look at Bathsheba couldn't hurt ... or Achan who thought a few bars of silver and gold taken from Jericho wouldn't cause any problem or ... the rest of us. Indeed, because of sin, all of us were walking dead. Big sins, little sins, every sin separated us from God and condemned. This is precisely why humankind's walking dead need and have been given a Savior. In this respect, we are in much better shape than the thieves who came into contact with the cobalt-60. There is no cure for their condition, but in God's Son we have received the antidote and treatment for our lost condition. Through His life, by His suffering, death, and in His glorious resurrection from the dead, Jesus has become the heaven-sent healing, which can cleanse sinners of all that had contaminated and condemned. With Holy Spirit-given faith we are no longer walking dead, we are eternally saved souls. Dear Lord, today we ask that You would help us not to play around with sin. Help us be strong to stand against the temptations that come our way. In the Name of Jesus. Amen.